Pyongyang, July 6 : US Secretary of State Mike Pompeo arrived in Pyongyang on Friday, where he is scheduled to meet North Korean leader Kim Jong-un and begin discussing the preliminary details of the Korean Peninsula's denuclearisation. Pompeo landed at Sunan International Airport after a stopover at the Yokosuka naval base in Japan, reports Efe news. During his visit, Pompeo is expected to address the deadlines and methodology for the dismantling of North Korea's nuclear programme. US President Donald Trump and Kim signed an agreement in Singapore on June 12 in which North Korea pledged to work towards its "complete denuclearisation" in exchange for Washington guaranteeing its security. Pompeo's meetings with North Korean officials will be the first high-level talks since the Singapore summit. "Looking forward to continuing our work toward the final, fully verified denuclearisation of #DPRK (North Korea's official name), as agreed to by Chairman Kim," Pompeo tweeted before landing in Pyongyang. Pompeo's visit to North Korea comes shortly after US reports, citing national intelligence officials, saying that Pyongyang has not only continued to enrich uranium since June 12 but that it would be trying to hide a good part of its arsenal and reserves from Washington. 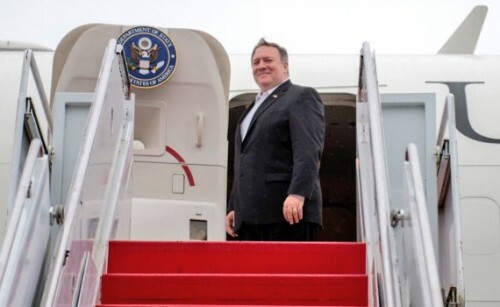 On Saturday, Pompeo will travel to Tokyo, where he is due to meet his Japanese and South Korean counterparts, Taro Kono and Kang Kyung-wha respectively, to analyse the results of his trip.